The most interesting reveal, though, is their Spartan Skeletor 6″ Scale Figure. The catalog lists it for release on July 1st, but that doesn’t seem to have been the case. We’ll keep our eyes open for further info. For new, click the banner image for the full page. Right before Toy Fair 2016, Mattel revealed that they had the Halo master toy license. At their event, they premiered the figures for the first time in public. They’re doing a few different styles. These include an assortment of fully articulated 6″ scale figures & vehicles. They also debuted some R/C Vehicles and role play weapons. Halo Mega Bloks Fireteam Asst. 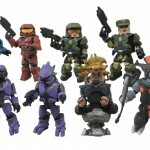 (SRP: $15.99) – Assemble your forces and prepare your troops for battle with the Fireteam Assortment by Halo Mega Bloks. Employed by the UNSC and Covenant alike, small units of highly-trained soldiers are used for tactical expertise and flexibility during combat operations. See all of the photos after the jump. Sideshow has posted the pre-orders for their Halo Spartan Red and Blue Leader Premium format Figures. Each statue stands at a massive 25.5″ tall. The statues come at a cost of $399.99 and they are limited to just 100 pieces each. They are expected to ship out next month. Read on to check out a full gallery of the Halo Spartan Team Leader Premium Format Figures. Sideshow has posted a preview of two new Halo statues. The preview gives us a look at the Halo Spartan Red and Blue Team Leader Premium Format Figures. The Spartans go up for pre-order on December 19th. We’ll update when more images and info are released. Read on to check out the preview. Discuss on the Toyark Forums› Views: 4579 › Credit: artasylum.com of the Toyark Forums! We originally reported on McFarlane’s Halo: Reach Series 6 back in September. Today, McFarlane Toys has updated with a list of changes. One of those changes is that the figures will now release in February 2012 (even though the site lists 2011 by mistake). Check out all of the updates below. Halo: Reach Series 6 should be available at most retailers in February 201. The team red Spartan Recon will now be available at Walmart and GameStop as well as Target. The white Spartan JFO will be exclusive to our latest newest Halo figure retailer, Walgreens. The rust Spartan HazOp is unchanged and remains exclusive to Toys’R’Us. The Headhunter 2-pack has been cancelled, but the Flaming Skull accessories are moving into the newly expanded Team Objectives set. This set still includes all the pieces that were previously announced, and we’ve added several bonus accessories to represent even more multiplayer gametypes. Set now also includes five Flaming Skulls (for Headhunter and Oddball), a Gray Flag (for Stockpile and 1-Flag CTF), and a Gravity Hammer (for Grifball). With all these new, extra accessories, the Team Objectives set will ship a month later than the rest of Halo: Reach Series 6. I’ll be available in March 2012, at the same time as Halo: Anniversary Series 2. We think it’ll be worth the wait! Finally, the Long Night of Solace set is not being produced at this time. Its figures may return in a future Halo: Universe series, so keep checking www.mcfarlane.com for new lineup announcements! McFarlane toys has revealed what will be coming in Series 6 of their Halo: Reach line. 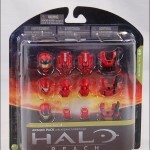 Our best-selling line of Halo: Reach action figures returns for a sixth series in early 2012. Get ready, because we’re bringing more Noble Team Spartans, more fearsome Elites, more massive Brutes, and a special emphasis on what keeps the fans coming back to Halo: Reach — multiplayer action! With single figures, two-packs, three-packs, and accessory packs, this series has something for everyone. 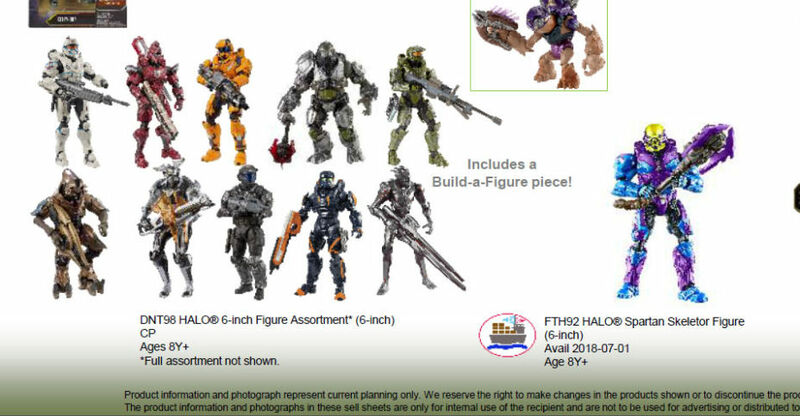 Mcfarlane Toys has posted some images and info for their upcoming Halo: Reach Series 4. 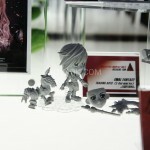 The new figures are scheduled to hit stores sometime in July. Series 4 includes new single packs, 2-packs, 3-packs, armor sets and vehicles.